It’s cold and gloomy here which is perfect soup weather. Especially when that soup has a little heat of its own from some spicy jalapeno peppers. I'm not really ready for winter weather yet -- I held out as long as I could before having to turn the heat on but with temperatures getting down in the 30s and 40s, this week was the end. The beautiful fall weather is over; it’s cold and dark before 6:00 at night, which means it’s almost winter. Have I mentioned that I really don't like winter? I look forward to the holidays, my birthday, etc but after that, I pretty much look forward to spring. I could do without the snow and gloomy dark days. But anyway, you're here for the soup recipe not to listen to me complain about the weather. 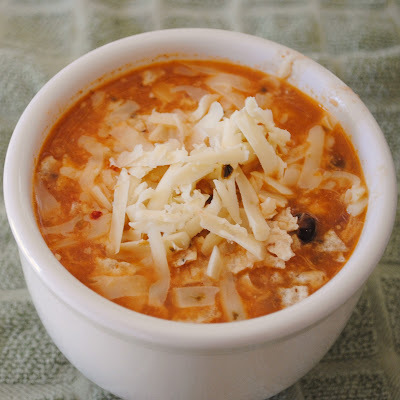 I'm calling this chicken enchilada soup because the flavors remind me of the enchilada soup at Chili's. This one has a few extras in it though with some corn and black beans. 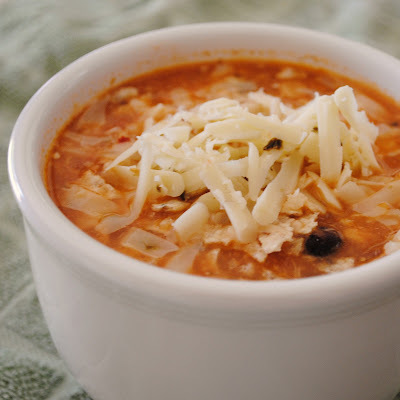 I used two kinds of cheese, a grated pepperjack cheese which adds some extra heat and melts beautifully and some crumbled cotija cheese which has a very mild flavor but adds a delicious creaminess to the soup. I poached the chicken in chicken stock with some spices and then shredded the chicken and returned it to the soup later in the cooking process. You can use boneless or bone-in chicken for this just remove the skin before cooking. You could also make this soup in a crockpot, you'll just have to extend the cooking times - expect that it will take at least 3-4 hours on high and you'll probably want to use a 5 quart crockpot. You can cook the chicken prior to adding to the crockpot or just put it all in together using chicken breasts cut into smaller chunks. Add everything except the cheese and cilantro and cook. Add the cheese and most of the cilantro just before serving to allow it time to melt, serve and top with cilantro. In a large Dutch oven or stockpot, add chicken stock and heat over medium heat. Add chicken breasts, cumin, chili powder, and cayenne pepper. Simmer about 20-25 minutes until chicken is cooked through. Remove chicken and set aside. Add tomatoes, jalapenos, bell pepper, onion, and garlic to the pot. Simmer about 30 minutes, covered until tomatoes have begun to break down. Add black beans, corn, and tomato paste and stir to incorporate. Add cotija cheese and half of the pepperjack cheese and stir to melt. Return chicken to soup and cook about 20 more minutes until desired consistency. If soup isn't as thick as desired, you can add strips of flour tortillas. They will dissolve into the soup to thicken the broth. Add cilantro, reserving some to top individual bowls if desired. Ladle into serving bowls and top with crushed tortilla chips, reserved pepperjack cheese and cilantro if desired. This looks sooo good for a cold night. I can't wait to try it! This is definitely the kind of meal I've been craving lately! Great heart-warming soup recipe. We are moving into making more soups and stews as well. This definitely looks like something that will warm you up on a cold day! When do I put the chicken back in? @Recovering Sociopath - oops sorry about that one - add the chicken back in when you add the cheese and simmer. I've corrected the above directions. mmm this looks so good! about how many servings does this make? Jamie -- it makes a lot, probably a good 8 - 10 big servings at least. Thank you! This was delicious. I am making it again this week. I made the crock pot variation of this today, with a few changes since I didn't have all the ingredients...SO FABULOUS. I'll be making this regularly. It'll be great over rice, I bet. My daughter was just talking about this soup last week! Thanks for the recipe, we are definitely trying it. What can I use to substitute for the cojita cheese? And, can the leftovers be frozen? Looking forward to trying it! @Angela - you could substitute more pepperjack, monterey jack, colby jack, cheddar, whatever you have on hand. @Angela - oops forgot the 2nd questions - yes you can freeze the leftovers. I would reserve the cilantro and cheese and add it when you reheat the soup. I made this soup last night and loved it! Will definitely be adding it to our rotation! How many servings does this soup make? It looks delicious! This sounds wonderful! I'm pinning this to my pinterest board. I can't wait to make it! I made this yesterday, crock-pot version. The onions took a bit longer to cook but the end result is fabulous! Recommended! I made this today in my crock-pot. It took about 4.5 hours on high, for anyone making it this way. It was absolutely delicious. Thank you for such a wonderful recipe! This looks really good! I love it! Something I can put in the pot when I am too busy to spend hours in the kitchen. Thanks! OH my! thank you, with winter coming up we will be enjoying this both as a soup and in quesadillas! What a great little soup. Thank you great idea and I am so learning how to use the crock pot! I made this today - Love it! My husband said it tastes like it came from a restaurant (in a good way) Thanks for the great recipe - it won't be the last time my family sees this! Have not seen cotija cheese, is there something that can be substituted? @Moe - you could substitute more pepperjack, monterey jack, colby jack, cheddar, whatever you have on hand. Cotija cheese can generally be found with the Mexican grocery items in the cooler section of my grocery store but I'm sure the availability varies by area. This may seem like such an elementary question but I'm not experienced cook so forgive me. Do your jalepenos have to be fresh or can they be pickled like the kind in the jar? @cameron - you can use the jarred kind if you prefer. I prefer to use fresh but it won't hurt it to use the jarred kind but I to think the flavor and intensity vary so you may want to adjust the amount. I just finished making this soup and it tastes delicious. It certainly makes a large portion, and there is more than enough to feed six people. I used fresh Greek feta cheese (it has a wonderful creamy texture) as it is quite difficult to come across cotija cheese in the United Kingdom. Will be making this again! I made this tonight, and it was fantastic! I will definitely make it again, but I think I'll use my immersion blender to incorporate the tomatoes, after simmering and before adding the chicken back in. That's only based on my texture preference. EXCELLENT RECIPE! Looks and sounds wonderful can't wait to try it, thank you!! Excellent! Made it in my crockpot w/quesadillas....so good. Thanks for the recipe! I'm making this for the second time tonight and already it's the whole family's favourite meal. Just amazing! I'll be making this every week from now on! This was delicious! I made it in the crockpot instead of the stovetop and it came together perfectly. Also, it made so much that I froze about 3 or 4 servings, and when i defrosted them, the soup was still great. Two thumbs up! I made this tonight and I was really pleased with it. It is spicier than I would normally do, but when I ladled the soup into bowls, I added the pepperjack and cilantro as directed, then added some sliced avocado. The avocado really helped turn down the heat and I used lime flavored tortilla chips which added another layer of flavor. I highly recommend it! I added all the ingredients (excl. the beans, corn, coriander, cheese and chops) to the slow cooker and cooked till chicken was tender. I added half the corn and bean and liquidized to desired consistency. Add the the shredded chicken and remaining beans and corn. I froze mine into individual portions (topped with cheese and coriander) and defrosted with no problems! i made this last night it was amazzzing! my boyfriend doesnt even like ANY of the ingredients included besides chicken corn and beans(pickiest eater alive)and even he loved it! im wondering though, does anyone have the nutrion guide for this recipe? we strictly count calories and all that so i needed to enter it into my daily diary. How do you make the crockpot version? Read the paragraph above directly above the ingredient list. Can I cook the chicken breasts in the crock pot with all the other ingredients? I made this today and it was so yummy!! I threw everything into my slow cooker this moring and when I came how today it was done. thanks for a great dinner for when I came home today!! just found this- made some adjustments that worked for me and brought this to work today for a soup week- everyone LOVED it. thanks for sharing. In your personal opinion....does it come out better in the stock pot or the crock pot? And can you use flavored tortilla chips to top it with? If so, any suggestions that you might have tried? I made this tonight. It is amazing. I did substitute queso fresco for the cotija cheese. It was great but I think I may try the cotija next time. Even using a little less cayenne than called for, it was still a little more spicy that we usually like but it was still amazing. This one is definitely going in the family cook book. Thanks. Made this last night in my crockpot. It was delicious! I used 2 boneless skinless chicken breasts and just threw them in whole. Since my daughter can't handle much heat, I used no jalapenos, but used a small can of green chilis. I also used less cayenne than it called for and used half ancho chili powder and regular chili powder. Somehow I was out of my big cans of tomatoes, so I ran a can of regular diced tomatoes and a can of stewed tomatoes through my blender before adding. I also left out the tomato paste and the consistency was perfect for us. My crockpot runs hot, so I let it cook 5 hours on low, removed the chicken breasts, shredded them, and put them back in. SO GOOD!! Thanks for the recipe! With the crockpot version..cook chicken first or in crock pot? Which is better? Cant wait to try..looks delish snd great reviews! In the slow cooker is it better to put in raw or cooked first? What did most do? Cant wait to try! Looks delish and hss gotten great reviews! You can cook them in the crockpot with everything else without any issues. Enjoy! This was perfect for a cold and damp night! Thought the jalapenos may be a bit too hot for us, so I switched to a can of chopped green chillies and reduced the amount of cayenne. Just enough heat and great flavor! Thanks for the recipe and have added into my soup favorites file. I just made this for the first time tonight. It is so good! Thanks for sharing! Made last night, with my own spin (less spicey) on the stove and it was a hit! So hearty and healthy--thanks! Okay.... question for you about the Jalapenos. I saw where you said you could use either jarred or fresh and that you prefer fresh. When you say 4-6 jalapenos, if I use fresh do you mean 4-6 whole peppers or like 4-6 sliced rings (like you would get out of a jar? I am making this right now and so far minced up two whole peppers and it seems like an awful lot. I am worried the soup would be too spicy. Start with a couple if you prefer and add more later based on your tastes. I use 4-6 whole peppers. I made this today via Pintrest. It was delicious. I didnt put but one jalepeno pepper. This one's a keeper. Thanks! I discovered this soup about a year and a half ago. As soon as I found it, it became an instant favourite - and I've made it for a lot of people! I use different chillies and different cheese because of what's available in New Zealand, and I use fresh corn when it's in season. Thanks for such a great recipe! I made this today and it was delicious! Thanks for sharing your recipe! I have made your recipe a TON of times now and it turns out great each time! I make it in the crockpot mostly, sometimes i'll cook the chicken separately though depending on time. We also have been adding the cheese just to each bowl as we eat it. Thanks for a great recipe!! Does the chicken go back in whole or is it to be shredded?